When the weather outside is frightful, cocktail time is sure delightful! People love to drink seasonally so we are thrilled to bring you this culinary inspired cocktail was created in the “Liquid Kitchen” of Marcia Selden Catering by our favorite drinkmaster, Jeffrey Selden. 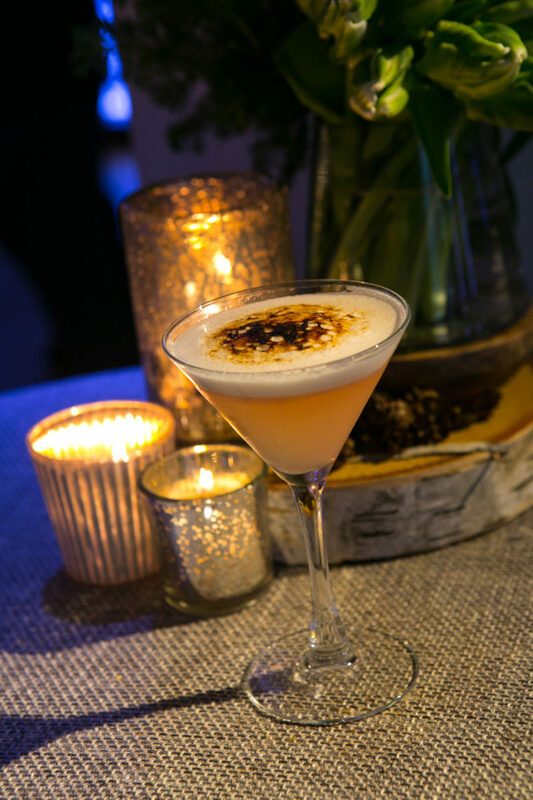 This recipe for the Brûléed French Blonde Martini is the perfect holiday drink recipe for toasting at parties as well as for enjoying on chilly winter nights. It’s as pretty as it tastes, and the brûléed top is a showstopper for holiday parties or winter get-togethers. Brûléeing the “meringue” gives it warmth that balances well with the lillet and gin. Watch this cool video to see the brûléeing in action! Put all ingredients in a cocktail shaker with ice – Shake for a full minute until foamy. Divide into 2 martini glasses. Sprinkle with a top coat of white sugar, and then use a kitchen torch to create a brûléed topping. Robin Selden is the Managing Partner & Executive Chef of Marcia Selden Catering & Event Planning, the” it” caterer of Connecticut for nearly 38 years, orchestrating premier parties and weddings throughout the tri-state area; cooking for commanding companies, countless celebrities, and political dignitaries including 3 former US Presidents. They have offices and operations in Stamford & Greenwich Connecticut as well as an office, kitchen and venue in New York City. Robin is the current International Caterers Association President and was named their Chef of the Year in March at the Catersource conference. She was also named as one of the Innovative Chefs of 2016 at the Greenwich Food & Wine Festival and was the only catering chef and the only woman chef. Selden spearheads the company’s Marketing and Public Relations platform and is featured monthly on 5 food blogs as well as countless magazines.